Oath Chart Of Nitesh Kumar: What Stars Foretell ? Nitish pulled out of grand alliance with RJD, Congress yesterday ; this is his 6th term as chief minister. 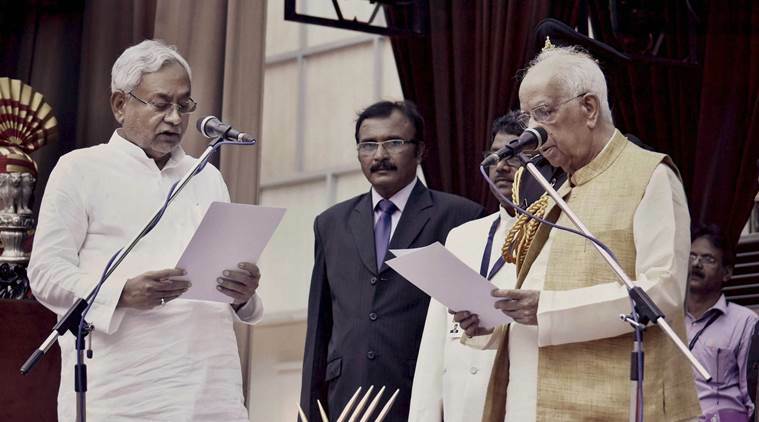 In a little over 12 hours after he resigned as chief minister of Bihar – pulling out of the mahagathbandhan with the RJD and the Congress – Nitish Kumar was back in the chair on Thursday morning with a different but familiar partner – the NDA.Sharp at 10 am, Nitish Kumar was administered the oath by Governor Keshari Nath Tripathi, heralding his sixth term in power. BJP leader Sushil Modi was sworn in as the deputy chief minister of Bihar, a post he had held before from 2005 to 2013. Other ministers will be sworn in after Nitish Kumar proves majority on Friday. Nitish ended his two-year grand alliance with the RJD and Congress on Wednesday evening, citing a “call of conscience” over corruption charges slapped against his former deputy and Lalu Prasad Yadav’s son Tejaswi Yadav. Lalu, his wife Rabri Devi and Tejaswi are central to a CBI inquiry into the land-for-hotels deal when Lalu was the Union railways minister. Nitish had nearly a decade alliance with the NDA before he split in 2013 as soon as Narendra Modi was announced the face of the BJP campaign for the 2014 general elections. After the JD(U) was reduced to two seats in the 2014 general polls, Nitish teamed up with Lalu Prasad Yadav and the Congress and the alliance made the NDA taste its first big defeat in the 2015 state polls. Nitish has since campaigned in Uttar Pradesh calling for a ‘Sangh Mukt Bharat’ and a ‘Sharab Mukht Samaj’. After the grand alliance had formed, he had called out the BJP for playing the “politics of dividing… be it in the name of caste or religion”. Prime Minister Narendra Modi, who lauded Nitish last night for choosing honesty over corruption, had hit out at the leader in 2015, caustically suggesting there was something wrong with his DNA for deserting his friends. Nitish quit on Wednesday after a few-day staredown with alliance partner Lalu Prasad Yadav over Tejaswi quitting his post as deputy chief minister. Lalu called a meeting of his party leaders Wednesday afternoon and made it clear his son would not quit, and also reminded Nitish that the RJD had made him chief minister. That seemed to be the last straw for a relationship that was withering, given Nitish’s decision last week to skip Sonia Gandhi’s lunch and dine with the Prime Minister instead. He had also supported demonetisation, the surgical strikes and BJP’s candidate Ram Nath Kovind as President. Lalu Prasad called Nitish’s exit a “setting of the RSS and the BJP”. “In the circumstances that prevail in Bihar, it became difficult to run the grand alliance government,” Kumar said outside Raj Bhavan after submitting his resignation to Governor Keshari Nath Tripathi on Wednesday evening. A few hours after he had quit, Nitish had got the BJP’s support to form the new government. Nitish’s JD(U) has 71 MLAs, RJD 80, Congress 27 and NDA 58 in the 243-seat Assembly. JD(U) and NDA have the clear majority while the RJD-Congress is 15 short of a simple. It is advantage BJP once again with this return back to power in Bihar, while the Opposition struggles to keep its flock together. It is advantage BJP all the more because Nitish Kumar – with his very clean image and intolerance for corruption — was being seen as the tallest leader in the secular front that could challenge Narendra Modi. Dur Muhurat between 09-43 to 10-36 hrs. Gulika Kalam 08-36 hrs. to 10-16 hrs. Benefics in the Kendra and Malefics in the 3,6,11 are good and 9th Lord in the 10th house But See the following Parameters , the Oath Chart may Look strong But Losing strength. In the Oath Chart the Connection of the 10th and Lagna Lord in the 12th house aspected By Fallen and Retrograde Saturn as the 6th Lord is making clear that there will be a Battle and Tejeswi Yadav will approach the High Court where the application may be rejected since the argument from the Nitesh Kumar side will be that the Governor was satisfied with his bloc of mandate larger number clearly and was Proved in the Vote of Confidence and the Governor did not act inconstitutionally. From the Planetary Positions it seems that the matter may go to the Supreme Court . The Lagna Lord and the 10th Lord of the D10 of Dashamsha chart Mercury is in Benefic Shashtiamsha and hence no effects it so seems but the Tenure seems not good due to Moon affliction badly . and Saturn aspect has the Capacity to create evil. The Oath Taking Chart is Precarious and aspect of the 6th Lord Fallen and Retrograde Saturn on the Lagna Lord,10th Lord with Moon in the 12th house where Rahu is also Placed in Forward motion is most Critical Parameter , although the Lagna Lord and the 10th Lord Mercury is in a Benefic Shashtiamsha , Rahu is Placed in a Leo Sign has the Capacity to Bring unexpected circumstances for the Govt. Rahu is the Only Parameter which has the Capacity to Turn the tables , else there is respite from the court Orders.